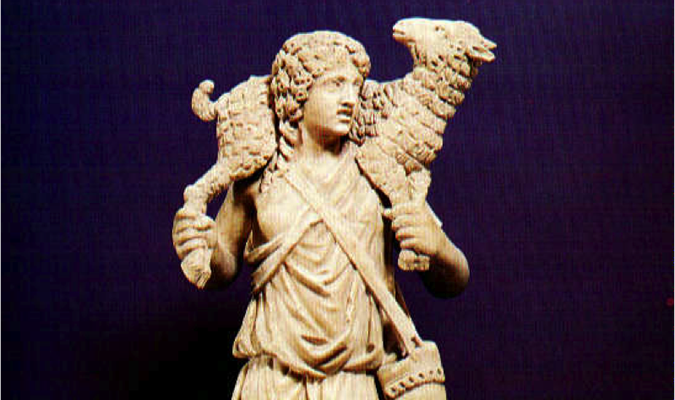 This Sunday is called Good Shepherd Sunday for good reason. In each year of the three year lectionary cycle, the gospel text for the Fourth Sunday of Easter are chosen from Chapter 10 of the Fourth Gospel which gives us the discourse on the good shepherd. This year, we are treated to verses 11 to 18 which provides us with a description of the good shepherd, a description in which only Jesus can fit the role to perfection, and yet a description that must be the ultimate benchmark for all shepherds of souls within the Church today. It is for this reason, that the Church has also declared this day as the day of prayer for vocations to the Priestly and the Religious Life. In the person of the Good Shepherd we find the eminent example of one who is essentially dedicated to others in a permanent attitude of self-giving. His life is a constant reaching out to others. Different from the hired man, he is ready to lay down his life, sacrificing himself, in order to safeguard the flock from dispersion and destruction. There is a reciprocal, personal knowledge between him and his own; he knows each one by name and enters into a deep profound communion with them. In fact, this knowledge - communion springs out from that same knowledge that unites the Father and the Son. Thus Jesus is the model the ministers of the Church are asked to follow and imitate. Through his call, they participate in his being the Shepherd of the Church. United to him, they learn what it means to love, to love without self-interest, to love to the end. He is their ultimate measure, there is no other. It is in Christ, that every person finds his true vocation. The word “vocation” here comes from the Latin, “vocare,” which means “to call.” Thus a vocation speaks of a “calling,” “God’s calling” to be exact. If one seeks to broaden the definition, then we can speak of every baptised person having a vocation - a call - to love and serve God. How you choose to live out that vocation is what each person must discern. Some feel called to live as single or married laypeople; others choose consecrated life and join a secular institute or religious community; still others choose ordination as deacons or diocesan priests. But today, is a special day when the Church invites us to think about and pray for vocations to the priesthood and the religious life. This is more than just a recruitment drive by the church – we can all acknowledge that the Church needs more clergy or religious or even lay ministers. This way of thinking, however, reduces such vocations to a mere job – a vocation is so much more than a job. Here comes the question which seems to be on everyone’s mind - What sort of man must a priest be? Perhaps, the common answers we would most likely hear or would expect to hear is that he must be a man who is prepared to listen to his people, a good administrator, a man of moderation, a man able to juggle his time and attention between the old and young, and he must be able to solve a whole long list of problems. I guess if you are looking for the perfect candidate for the job, you will not find him. As much as we would desire our shepherds to have a variety of people skills – that they be good managers, good listeners, good planners, good communicators, good speakers – this is not their calling. So what sort of shepherds do we need? The Church would require that such a man must above all be a man concerned for God, for only then will he also be truly concerned about men. The priest must not be someone who merely does his job and is content with that. No, he must be seized by God and gripped by God’s concern for men and women. He must in some way think and feel with God. He must think and feel like the Good Shepherd in today’s gospel reading. Today’s gospel provides that measure and I would like to especially invite all young men in the congregation to pay attention. First, a good shepherd is one who lays down his life for his sheep. And so when young men begin to discern, when seminarians are being formed for priestly ministry, and priests who are already in ministry subject themselves to honest self-examination, they must apply themselves to this paramount question – Do I have a capacity for self-giving, self-sacrifice or living for others? Second, the hired man is not the shepherd. The shepherd must be able to serve with simplicity, humility and without wanting personal gain or benefit. He’s not in it for the money, the fame, the power or the fringe benefits. The priesthood is not a job. It is a calling, a vocation. Third, the shepherd knows his own and his own knows him. Knowledge leads to communion. From the mystery of God's eternal knowledge, from the intimacy of Trinitarian love springs the priesthood and the pastoral mission of Christ. The shepherd is one who strives to understand his people, listens to them, journeys with them, struggles with them, and eventually, as Pope Francis is fond of saying, begins to “smell” like his sheep. Fourth, the shepherd has to lead and guide other sheep who are not of his fold, as there can only be one flock, and therefore one shepherd. Christ’s pastoral mission is a universal mission not limited to the members of the visible Church, but, by virtue of his sacrifice on the Cross, embraces all men and all peoples. The shepherd must have a missionary heart that goes beyond the line of duty, crosses boundaries, and works across cliques, affiliations, personal preferences, as he seeks to bring everyone under the one fold of God. This set of criteria may seem daunting and unattainable. No one can claim to come close to the perfect self-giving of the Good Shepherd who laid down his own life for his sheep. All of us are keenly aware of our unworthiness, imperfections and limitations. To let you in on a little secret, we priests often struggle with this throughout our ministry. As a priest, I must confess that the “job” often seems overwhelming, and the demands of ministry seem to go beyond my limited abilities. But our greatest consolation comes in the realisation that we don’t need to have it all together, that we don’t need to have all the answers, and that the troubles which plagued this Church and the world need not rest solely on our shoulders. Indeed, my greatest consolation comes in this realisation that I too am a sheep, in need of care from the Good Shepherd, and He has laid down his life for me! And if he has called me to this ministry of service, then He would surely provide sufficient grace to sustain me. Thus, the vocation to and ministry of the priesthood is both something which is great and yet humbling. This is what our Holy Father Pope Francis said in his homily during last year’s Chrism Mass. “I do not think it is an exaggeration to say that priest is very little indeed: the incomparable grandeur of the gift granted us for the ministry sets us among the least of men. The priest is the poorest of men unless Jesus enriches him by his poverty, the most useless of servants unless Jesus calls him his friend, the most ignorant of men unless Jesus patiently teaches him as he did Peter, the frailest of Christians unless the Good Shepherd strengthens him in the midst of the flock. No one is more “little” than a priest left to his own devices; and so our prayer of protection against every snare of the Evil One is the prayer of our Mother: I am a priest because he has regarded my littleness (cf. Lk 1:48). And in that littleness we find our joy.” So please don’t forget to pray for your poor priests that they might have this joy in order that they become ever more capable of bringing souls to Jesus, Our Good Shepherd.